The San Diego Unified Supt. 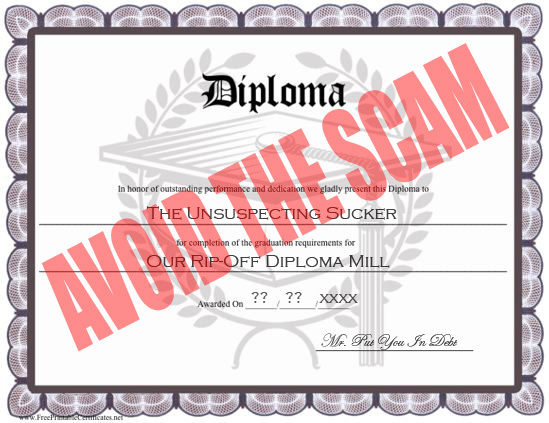 Cindy Marten 2015/16 DIPLOMA MILL SCAM – Marten Unethical Opportunism Exposed!!! di·plo·ma mill (noun) – an institution or organization that grants large numbers of educational degrees based on inadequate or inferior education and assessment of the recipients. In the autumn of 2015, SDUSD Supt. Cindy Marten was proven as an abject failure. Between being named by the San Diego County Grand Jury as co-conspirator in the Trustee Marne Foster debacle and failing CAASP scores, Marten had no place to hide her administrative and educational ineptness even with the unlimited crony protection by SDUSD Trustees Marne Foster, Richard Barrera, John Lee Evans, Kevin Beiser and Mike McQuary. But Marten and her unscrupulous inner circle were handed a solution by the California State Legislature and Governor Brown to save their egos..and their skins in the summer of 2015. The “trigger” for the unscrupulous Diploma Mill Scam strategy was the revocation of the California High School Exit Exam…the CAHSEE. To achieve the fake Graduation Rate, Marten took the not “learned the material” to another level. Once the CAHSEE exposure was removed, the clear failure of Marten exhibited by the poor Common Core CAASP results and inadequate, inequitable ELL and financially challenged Student support strategies was replaced by her Diploma Mill Scam. On May 16, 2016, in the aftermath of numerous SDUSD Supt. 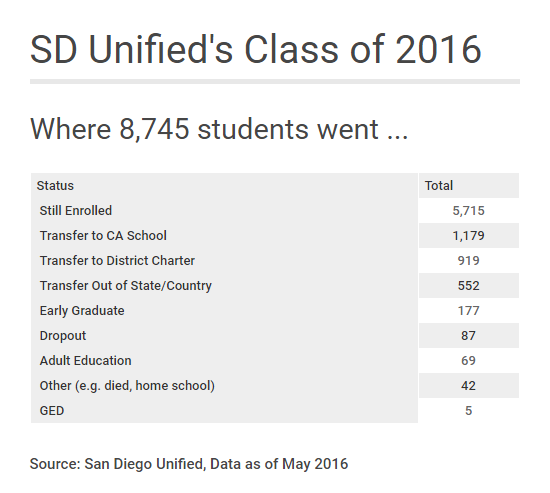 Cindy Marten statements to media outlets touting a fake 92% graduation rate we posted “The San Diego Unified Supt Cindy Marten Diploma Mill Scam – Introduction”. Subsequently, in a followup article in the VOSD, the “Grad Rate Miracle” was that credit recovery was accomplished through online classes. This “news” was probably already known by virtually every SDUSD Instructional employee and every family (and there were many) whose student actually took an Edgenuity online credit recovery class. But there is MORE…a LOT MORE! NOT listed in the VOSD articles, or anywhere else, are the unethical tactics willfully ignored by Supt. Marten and her inner circle cronies that District Deeds classifies as “Grad Rate Scams” to produce the SDUSD Diploma Mill. Supt. Cindy Marten has enthusiastically embraced online class credit recovery with no proctor. Classes can be done anywhere remotely from any computer as long as that individual has a valid logon and password. According to an article by Pearson titled “Controlling Cheating in Online Courses-A Primer”, there are seven “fairly low tech” ways a student can cheat with Online Classes and Tests. Through conversations with San Diego Unified Students, District Deeds has learned that High School and College Students have started their own “Black Market” businesses completing Edgenuity classes online for a variety of payments. For completing classes, these Black Marketeer Students may be paid with cash, drugs or alcohol. For a single lesson, the payment can be as simple as food…a lunch or dinner. There are stories from Teachers and Counselors of Students who have failed a class twice and then actually completing the same class in single week on Edgenuity and the credit was given with no questions asked. Just like a Diploma Mill!!! According to VOSD, 1,381 SDUSD took online classes WITHOUT a Proctor. An infographic from onlineschool.com estimates that 33% of students cheat in online classes. If that is the case, 460 SDUSD students or more, with no proctoring, could have cheated and may not have graduated. Adding those those 460 students not graduating would have dropped the graduation rate to 84%!!! District Deeds has verified that some a-g Science Courses provided by the SDUSD require 20% “wet lab” time. “a-g” refers to the subjects, and number of years of each, that are required to meet the subject requirement for admission to UC. Science laboratory design is consistent with the requirements for proper hazardous materials management specified in both the “Science Facilities Design for California Public Schools,” published by the California Department of Education, 1993, and the “Science Safety Handbook for California Public Schools,” published by the California State Department of Education, 1999. District Deeds sources have told us that Science Classes are being held ALL YEAR in libraries and plain classrooms with the knowledge and approval of the Principal, Area Superintendent and Supt. Marten with NONE of the functional requirements including plumbing, ventilation and equipment for the safety of Students and Staff. For example, on the La Jolla High School campus, a Science class requiring a “wet lab” was held in the Library with absolutely none of the Safety specifications identified by the California Department of Education listed above with a research paper improperly taking the place of the “hands on” Lab. If this violation can happen on the La Jolla campus with all the financial resources and community oversight through its La Jolla Cluster Partnership Agreement and Foundation, the odds are that this is a widespread issue across the SDUSD where there is a huge disparity in support for financially disadvantaged and immigrant student populations. For those regular and online Science classes in SDUSD High Schools that DO NOT comply with the 20% lab time and/or follow safety standards, the violations invalidate the Science Class credits, falsifies Student Transcripts and puts Students and Teachers health at risk. District Deeds could find NO proof of oversite by UC/CSU on the Lab conditions for students on each SDUSD campus. The enables the SDUSD Diploma Mill, under the guidance of Supt. Cindy Marten, to jam through credits with no risk of exposure. For many graduated students that have taken Science in these conditions and current Students that continue to take those classes, the SDUSD has essentially betrayed them and their families by falsifying their transcripts and invalidated their Graduation. 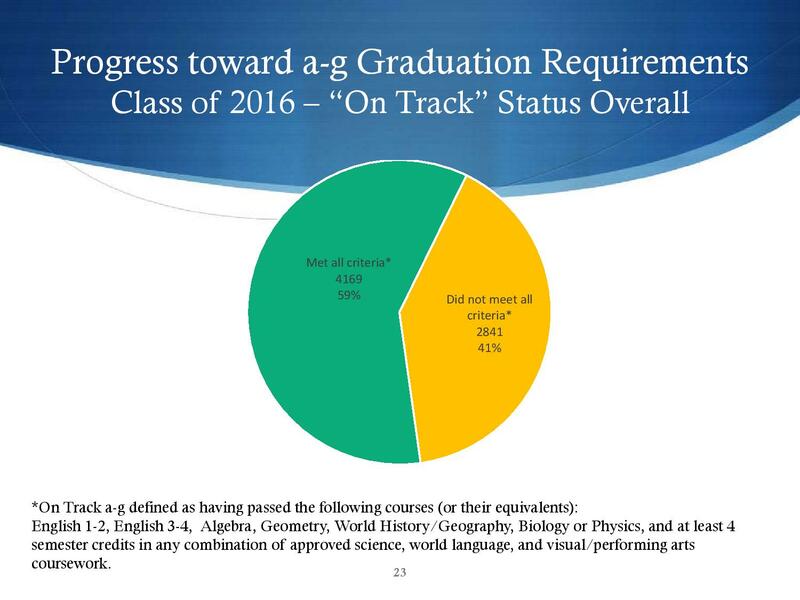 In conclusion, Science Classes, both online and in classroom, with an inadequate, illegal Science Lab environment eliminates the “D” in the touted A-G requirements and invalidate the 91% Graduation Rates that Marten and her SDUSD Trustee Cronies have bragged and essentially lied about for the past few months. According to the VOSD article every single one of the 11,023 student 2012 Freshman class are accounted for…there are NO “unknowns” on the list who started as freshmen in the class of 2016. There are only 87 dropouts out of the 11,023 students – a .8% Dropout Rate…eight TENTHS of a percent!!! Pew Research estimated that there was a 7% dropout rate in 2015, the most recent year measured. It is no different in the SDUSD. In conversations with SDUSD counselors, some students and families just disappear…no one knows where they went. There is NO “Unknown” on the list provided by the SDUSD to VOSD. Apparently the SDUSD decided to make them disappear from the reports also! Splitting the difference of the Pew Research report, that would add 3.5% to the dropout rate and adding 1% “Unknowns” from the 11,023 student total equals 496 MORE students to the non-graduate category. Adding those those 496 students to the other students not graduating would have dropped the graduation rate to 76%!!! Social promotion is the practice of promoting students to the next grade level even when they have not learned the material they were taught or achieved expected learning standards. 13. Waivers and Certification of Graduates: State-mandated coursework as outlined in Education Code §51225.3(a)(1) may not be waived. 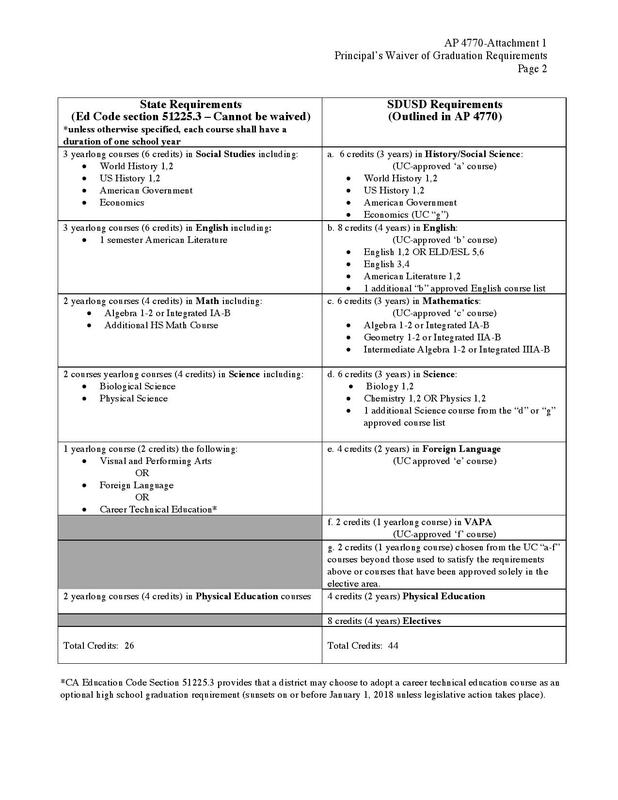 Waivers to other requirements adopted by the governing board of the school district may be granted in specific cases with compelling circumstances. With the Area Superintendent’s approval, the principal has the authority to grant waivers and will make the determination in each case. 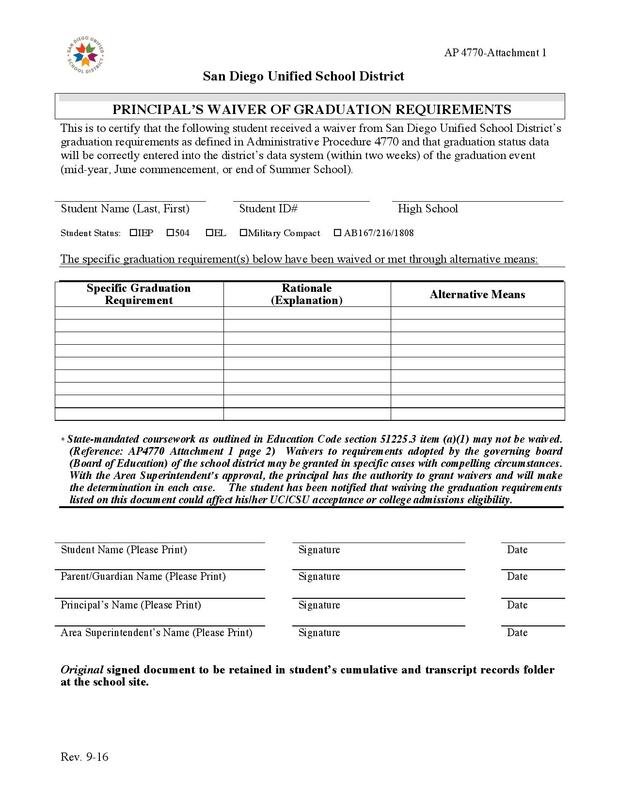 All such waivers must be documented on the Principal’s Waiver of Graduation Requirements form (Attachment 1), the information filed in the student’s permanent records folder at the school site, and the form retained at the school. 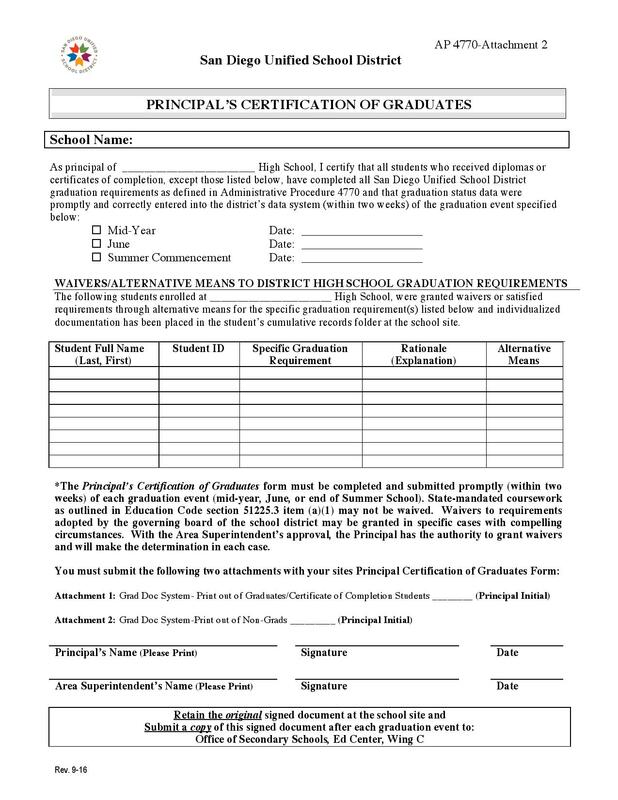 The Principal’s Certification of Graduates form (Attachment 2) must be completed and submitted within two weeks after each graduation event (mid-year, June, or end of summer school) to the Office of Secondary Schools. How many waivers are given each year in each school? Who knows…NOT on any Graduation Reports we can uncover. How does a student qualify for a Graduation Waiver? may be granted in specific cases with compelling circumstances. What TYPE of “specific cases”? What KIND of “compelling circumstances”? What EQUITY is there between High Schools on what is considered “specific cases with compelling circumstances”? Are the quantity and type of “Social Graduation” cases the same at Lincoln as they are at La Jolla as they are at Serra? As usual with Supt. Marten and the SDUSD Board…like the Marne Foster scandal…they are obviously hiding the facts to protect their own guilt. By ignoring the risks of online credit recovery and employing virtually no safeguards against Black Market Class Completion thereby allowing cheating to earn credits towards Graduation. By allowing Science classes to be run without “Wet Lab” time and turning the a-g “d” into “Dumbing Down” to maximize passing grades without actually completing the work according to CDE and UC/CSU requirements. By “cooking the books” and conveniently losing nearly 3,000 students between Freshman and Senior year with NO “unknowns” and only a ridiculously low 86 “dropouts” thereby decreasing the number of non-graduates to increase Graduation Rate. By hiding the scope and scale of Social “Graduation Waivers” to increase Graduation Rate. These 4 failures of trust and ethics by Supt. Marten, through her tactics to enact the SDUSD Diploma Mill Scam with the unlimited crony protection by SDUSD Trustees Marne Foster, Richard Barrera, John Lee Evans, Kevin Beiser, Mike McQuary and Sharon Whitehurst Payne has irrevocably damaged the quality, value and reputation of education in the San Diego Unified School District and put all its graduates at risk of failure when they advance to college or career. That betrayal of Students by Cindy Marten and the Board of Education PROVE they are no longer fit to serve as the leadership of the San Diego Unified School District.